Metric and Differential Geometry grew out of a similarly named conference held at Chern Institute of Mathematics, Tianjin and Capital Normal University, Beijing. 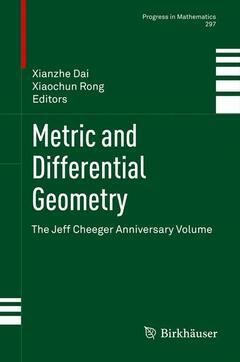 The various contributions to this volume cover a broad range of topics in metric and differential geometry, including metric spaces, Ricci flow, Einstein manifolds, Kähler geometry, index theory, hypoelliptic Laplacian and analytic torsion. It offers the most recent advances as well as surveys the new developments. Preface.- Blaine Lawson, Early Work of Jeff Cheeger.- Mike Anderson, Boundary value problems for metrics on 3-manifolds.- Xiuxiong Chen and Song Sun, Space of Kaehler metrics (V) – Kaehler quantization.- Reese Harvey and Blaine Lawson, Split special Lagrangian geometry.- Christina Sormani, How Riemannian manifolds converge: a survey.- Gang Tian, Existence of Einstein metrics on Fano manifolds.- Pekka Koskela and K. Wildrick, Analytic properties of quasiconformal mappings between metric spaces.- Assaf Naor, An application of metric cotype to quasisymmetric embeddings.- Jean-Michel Bismut, Index theory and the hypoelliptic Laplacian.- Xianzhe Dai and Richard Melrose, Adiabatic limits, heat kernels and analytic torsion.- Xiaonan Ma and Weiping Zhang, Transversal index and L2-index for manifolds with boundary.- Werner Mueller, The asymptotics of the Ray-Singer analytic torsion of hyperbolic 3-manifolds.- James Simons and Dennis Sullivan, Differential characters for K-theory.